Our story begins at a night club in deep space. Lobo, a bounty hunter, kills the entertainer in grizzly fashion; decapitating him and slicing him up. Twelve hours later he has travelled to an interstellar trading outpost in order to collect the bounty and get his next assignment. His contact there offers information that Lobo is seeking, as an exchange if Lobo will handle a smuggling job for her. Lobo takes the job, not knowing or caring what cargo he is carrying. This version of Lobo looks different; less outrageous, more stylish than the one we are used to. Lobo travels through a dangerous part of space, and is brought down by some space pirates. On the surface of the planet where he crash-lands, he confronts his attackers and does some more slicing. Lobo gets bloodied a bit; but his abilities include a fast-acting healing factor; so he is fine. Lobo checks the cargo bay in his ship. Lobo expects to find cargo. Instead Lobo finds aliens who were abducted from their home world. They were threatened with death, because their bones are rare and thus valuable. They are thanking lobo profusely, indicating that he saved them. But, when Lobo discovers that their bones are valuable, he locks them back up in the hull of his ship, and decides to make his delivery. Lobo goes to an illegal trade junction in Southern Cross, hands over the aliens he has imprisoned. As he fills out some forms, Lobo says that the worst part of killing is doing the paperwork afterwards. Lobo receives his reward from Rhialla, who sent him on the smuggling mission. It appears to be some sort of tracking device; or perhaps a powerful microcomputer. Lobo travels to Earth, home of the Lobo we are familiar with. The new, slimmer Lobo says the one we recognize, the traditional Lobo, is an impostor. The new Lobo says we don't know him; and we haven't even met him... yet. Story - 3: Let me go on record as saying that I like the concept of "Villains Month". For the last two years, we have seen the heroes reintroduced and sometimes reinterpreted. That all began two years ago in Justice League #1. Now it is the villains' turn. Weekly comics in September featuring the villains will give DC an opportunity to give us the definitive origin story for each major villain in the New 52; and to reinterpret those villains who need a fresh start. This issue changes everything we know about Lobo. We still have a ruthless bounty hunter and mercenary who will kill for a profit. But this Lobo comes in a more stylish package. Gone is the image of a biker rebel; replaced by someone with a more sleek appearance. 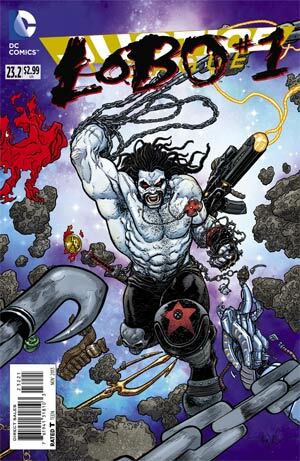 This version of Lobo is sleazy, but not quite as outrageous as the Lobo we are used to. I think it is an improvement. This version seems more sinister; less comical. As someone who cherishes treasure and profit above kindness and compassion, Lobo is a despicable character. That part hasn't changed. Lobo has power but no ethics. As such, Lobo can really be thought of as the opposite of Superman. By the way, it was not at all clear why there were two Lobos in this story. But I guess this is just DC's way of saying "Out with the old; in with the new." Let me mention here that, with four Justice League books to review in September, Michael J. Petty and I agreed to split them up, and to alternate coverage. So next week watch for Michael's review of DIAL E; and meet me back here in two weeks for my review of SECRET SOCIETY. Art - 3: The artwork is competent, and works well for this story. Cover Art - 4: I like the 3D cover. It creates a nice effect. The graphic showing the Justice League logo being obscured by the Lobo logo is very revealing and quite accurate. This is a Justice League book in name only; and in every other way is a true Lobo book.